Taking place in a reinvented Wild West universe where the frontier floats among the clouds, powerful cartels crave to control the most precious resource in the west: water. Players take the role of hired gunslingers that battle opposing fighters across floating islands in the sky. There are no health meters in Sky Noon; instead, to eliminate enemies, players use various super-power compressed air weapons to send them flying out of their boot spurs! Grappling hooks and lassos must constantly be used to prevent players from falling off into the great blue sky. 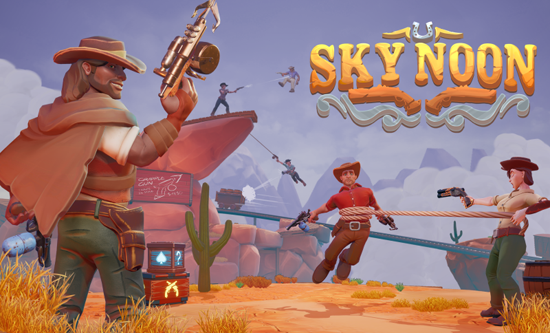 Combined with other items like steam-powered jetpacks, jump pads, and teleporters, cowboys need to be quick on the draw and light on their boots in the fast-paced, aerial mayhem of Sky Noon. Sky Noon is the two year long adventure started by lead designer Craig Taylor who, along with the other “core four” of Lunar Rooster, began creation of the game while studying game development at Auckland’s Media Design School in New Zealand. The dev team sought to design a multiplayer action game that captured the feeling of brawler games like Smash Brothers and Brawlhalla with the fast precision of first person shooters. The first Sky Noon prototype was demonstrated at SXSW Gaming 2017 to a great reception, and was a finalist for the Gamer’s Voice Multiplayer award.